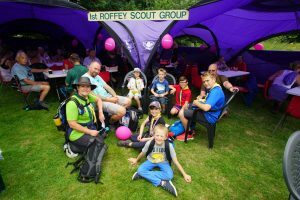 1st Roffey helped and took part in the 2017 riverside walk, which is a circular walk of 13 miles long which virtually encompasses the town of Horsham using paths alongside various watercourses. The walk passes through a number of different landscapes including woodland, pastures and farmland. The historical importance of the rivers is also reflected in the sites along the route. These include several mills, the remains of a motte, bailey castle and Leechpool woods. 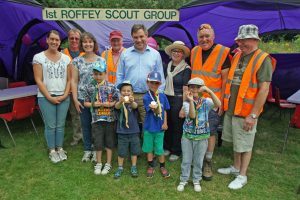 1st Roffey also supplied shelter at Warnham Nature Reserve in the form of mess tents that were erected by volunteers on the Friday evening and taken down on Sunday morning. A big thank you to all those who helped Chris Sillett with this task. 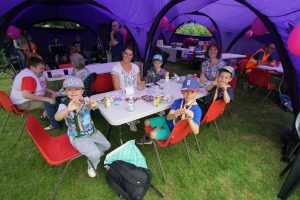 Everyone who took part in the day enjoyed themselves, the Beavers, Cubs, Scouts and Explorers, were a credit to the group and have raised some much needed funds, roll on 2018!